Although I continue to update this list with new stories, I recommend that you go HERE for a well-organized, fully up-to-date list of stories & links with abbreviated story summaries. If you’re looking for a specific ’ship, character, genre, or story-length, take a look at this page of fics sorted by type. Here are links to all of my HP fanfic stories with full summaries. Summaries are more detailed here than on the archives. At the bottom of the post, there’s a complete chronological list of the Resolving a Misunderstanding universe stories. There’s some Minerva-centric, Severus-centric, and Dumbledore-centric fics, among others, and a variety of ‘ships, including ADMM, SSPP, FFPS, DMGW, and SSHG, and there are a range of story-lengths and ratings. Go HERE for a well-organized, bare-bones, graphics-free list of stories & links with abbreviated story summaries. If you’re looking for a specific ‘ship, character, genre, or story-length, take a look at this page of fics sorted by type. The stories that are rated “M” or “MA” are posted to moderated archives and require the reader to login before viewing the story; any M- or MA-rated fics that were posted to ffnet have been “bowdlerized” if necessary. OR possess some ADMM content, even if it’s not the focus of the story. To go to a story, just click the banner for the corresponding fic. Resolving a Misunderstanding*: Minerva returns to teach at Hogwarts, and her relationship with Albus develops after a misunderstanding leads to an embarrassing moment, regret, and, eventually, resolution. Minerva-centric ADMM friendship-to-romance story. Covers Albus and Minerva’s relationship from October 1937 through October 1957; romance portion of the story spans 4 July 1957 through 4 October 1957; a few chapters retell some of Albus’s youth and adulthood from approximately 1849 through the defeat of Grindelwald in 1945. Completely disregards DH. Characters: Minerva McGonagall, Albus Dumbledore, Poppy Pomfrey, Horace Slughorn, Rubeus Hagrid, Tom Riddle, Wilhelmina Grubbly-Plank, and many others. A T-rated version of Resolving a Misunderstanding is available on FanFiction.net with the mature content edited. Also available on Lumos in the full, unexpurgated version. Resolving a Misunderstanding was selected to be a featured story on TPP during January 2008 and was a featured story on Sycophant Hex Lumos in May 2007. If you have been reading Resolving a Misunderstanding and want to see the compendium of information on the story, including an outline of the chapters, a chronology, information on the character names, and translations of the “magical Latin” used in the story, take a look at this entry. “The Unsentimental Arithmancer”: Albus Dumbledore comes to know an Arithmancer and her husband. A Gertrude Gamp one-shot romance. Set in the Resolving a Misunderstanding universe in 1917. DH-disregarded. Characters: Albus Dumbledore, Gertrude Gamp, Reginald Crouch, Fawkes. Also on ffnet and on Lumos. Available in pdf. A Holiday with the Headmaster*: Albus and Minerva take a holiday before the onset of the school year. Set in late August 1957. Part of the Resolving a Misunderstanding universe, but it’s not necessary to be familiar with that story to enjoy this one. ADMM. Takes place between the chapters “The Silent Knight’s Tale” and “Back to Hogwarts” at the end of RaM. Not DH-compliant. Contact MMADfan about the pdf version. There’s a T-rated version available on fanfiction. net called “A Little Holiday.” It has all the romance and fluff of the original, but the adult content has been edited to make it suitable for a wider audience. The chapters have been combined into five parts for ffnet. “Obliging Minerva”*: The Headmaster’s been very busy lately. His Transfiguration teacher needs some time with him. One-shot. Set in October 1957. Part of the Resolving a Misunderstanding universe, but it’s not necessary to be familiar with that story to read this one. ADMM. Not DH-compliant. DH-disregarded. “Now is Perfect”:Discovering what it is you want may help you recognise it when the time is right. Fluffy one-shot. Written for Eloquent Phoenix for the CR First Anniversary FFPS Gift Exchange. Set in the RaM universe, but can be read as a stand-alone fic. An Act of Love*: Severus Snape is hit by a stray spell, which has unanticipated and undesirable consequences. When he begins to feel some side-effects from the spell, Severus seeks the help of a colleague. Written in response to a challenge prompt. Set in the RaM-universe and disregards DH. September 1996. Characters: Albus Dumbledore, Minerva McGonagall, Severus Snape; other characters include Poppy Pomfrey, Hermione Granger, Pansy Parkinson, and Draco Malfoy. ADMM, quasi-MMSS, and a hint of SS & HG friendship/potential SSHG. See individual chapters for warnings and author’s notes. Also available on Lumosand Occlumency. and chosen to be a Featured Story on Sycophant Occulmency in November 2007. Death’s Dominion*: Severus Snape’s life was changed when he was hit by an errant spell, and he comes to a decision that defies Dumbledore’s wishes. Even the fate of the wizarding world is altered by this one ill-cast curse and Snape’s subsequent resolve. Long after the spell itself has dissipated, its effects continue echoing in the lives of Severus, Albus, Minerva, and Hermione, and they bring with them a shadowy figure whom Snape does not trust and whose motivations and influence on Minerva are murky. September 1996 – July 1998. This is a “Light fic” (as opposed to a “Dark fic”), but it isn’t necessarily light reading. AU. A “DH-twister.” Only partially HBP-compliant. Not DH-compliant. Snape-centric. Now also on fanfiction.net, rated M (a few scenes are very slightly edited for language and explicit content). 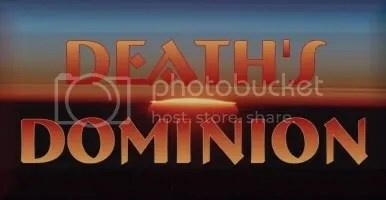 Death’s Dominion has a sequel, A Long Vernal Season. Scroll down for the link. “Budding Charms”: A series of loosely related light, fluffy drabbles. Short, posted in one shot on TPP. Characters: Filius Flitwick and Pomona Sprout. Set in a RaM-like universe. “Circadian Rhythm”*: Four sets of five drabbles each, “Five Mornings,” “Five Afternoons,” “Five Evenings,” and “Five Nights.” Variety of pairings and no pairings. Pre-DH; not DH-compliant. Characters include: Albus Dumbledore, Fawkes, Filius Flitwick, Hermione Granger, Minerva McGonagall, Nymphadora Tonks, Pomona Sprout, Professor Binns, Remus Lupin, Severus Snape. “Falling for Pomona”: First impressions can be so important, but sometimes don’t we all hope they aren’t? Just a light little one-shot. Set in a RaM-like universe. Characters: Pomona Sprout and Filius Flitwick. Chosen to be a featured story by TPP for August 2007. “Impressing Filius”:First impressions are important, but they aren’t always mutual – or are they? Companion one-shot to “Falling for Pomona,” which should be read first. Set in a RaM-like universe. “Heat”: When an unnatural heatwave hits Hogwarts, two members of the staff generate more heat of their own. Set in the mid-eighties. Inspired by the “Circadian Rhythm” drabble of the same name. DH-irrelevant. NOT set in the same universe as An Act of Love! (Not RaMverse.) One-shot. Contact MMADfan about the pdf. “Lemon Drabbles”*: A set of lemony drabbles, each one-hundred words, featuring a variety of different characters and a variety of pairings. DH-irrelevant. Short, posted in one shot. “Lovesick?”: Ron is behaving very abnormally. Could he be lovesick, or is there another explanation? Now with a “prequel” chapter two! “Minerva in Hogsmeade”: Minerva finds chaperone duty in Hogsmeade very dull, until . . .
“Trunks”: Filius and Pomona each have a surprise awaiting them. Set in June 1959, just before “Now is Perfect.” Written in response to a CR flashfic challenge. Challenge word: Trunks. “Up a Tree”: Filius finds himself in an awkward position one afternoon. Set during “Now is Perfect” in June 1960. Written in response to a CR flashfic challenge. “A Christmas for Aberforth”*: When Aberforth’s plans for Christmas are ruined, Minerva has an idea. ADMM. Part of the RaMverse stories, but can be read as a stand-alone fic. Characters: Albus Dumbledore, Minerva McGonagall, Aberforth Dumbledore, and special appearances by Flossie & Mirabelle! “Snow: 31 December 1960”: The third installment in the “Cheering Charms” series on The Petulant Poetess. Characters: Filius Flitwick, Pomona Sprout Also posted to the CR Board in the “Fluff” section. It’s a drabble written in response to the CR board’s Yule Drabble Challenge, prompt word, “snow.” One hundred words, not including the title. “Invisible Lover” *: It’s the Easter holiday week, and Albus returns from London early to surprise Minerva. A lemony ficlet. ADMM. RaMverse, April 1958. The final battle ends, and Alastor Moody helps to usher another wizard into peacetime. Not DH-compliant. A Resolving a Misunderstanding universe story. Contains spoilers for Death’s Dominion. One-shot. “Enter, Peacetime” on TPP. (T-rated) “Enter, Peacetime” is a kind of “out-take” or missing scene from Death’s Dominion, and takes place during chapters twenty-nine and thirty (“They shall rise again” and “And death shall have no dominion”). “An Unexpected Shower” on ffnet (M-rated, lightly edited). A Long Vernal Season *: Severus Snape had believed that, for him, life after the Dark Lord was an impossibility, that his death was not merely justice, but necessity. He has survived, though, and now he must learn to live his new, unexpected life, and to find something beyond the narrow existence to which he was once bound. Not DH-compliant; partially HBP-compliant. A Long Vernal Season is a chaptered, post-war, Snape-centric fic, and is the sequel to Death’s Dominion. It’s a good idea to have read Death’s Dominion first. Contains Death’s Dominion spoilers. Although LVS can be read on its own, if you don’t read Death’s Dominion before reading LVS, bear in mind that DD and LVS are not DH-compliant and are only partially HBP-compliant. Ratings rise for individual future chapters; read chapter summaries and author’s notes for ratings, warnings, and characters. Poor Filius is suffering from a cold and then finds himself in an awkward spot when someone comes to visit. Warning: Spoilers for A Long Vernal Season, and for Death’s Dominion, to which Long Vernal Season is the sequel. Part of the Resolving a Misunderstanding universe of stories. Characters: Suzie Sefton, Severus Snape, Mr Ollivander, Rubeus Hagrid, Poppy Pomfrey, Draco Malfoy, and others. “Trevor and the Queen” on the Petulant Poetess (Rated K+). “Trevor and the Queen” on the Charming Roots board (Rated K+). “A Light at Dusk”*: Minerva needs a quiet, peaceful holiday to recuperate from a difficult term. Poppy kindly loans her the use of a small country cottage. “A Light at Dusk” on the Petulant Poetess. “A Light at Dusk” on the Charming Roots Board. “A Momentary Madness”*: Minerva has one foolish moment. Where will it lead? Short, fluffy fic. Rating rises. An ADMM gift fic written for Hogwarts Duo. Rated T, with one MA chapter in the unedited version. “The Sunshine of Kindness”: Early one summer’s morning in the Grimmauld Place kitchen, Remus tries to sway Sirius. Flashfic written in response to the CR Pick Three Challenge #6. “The Sunshine of Kindness” here on Read Some Fanfic Now. “A Spree with Albus”: Malcolm McGonagall has a “practical interview” with Albus when he is the new candidate for the Defence Against Dark Arts position. It just happens to include a dragon and a duel . . .
An out-take from Resolving a Misunderstanding, Chapter CXXXV: A Spree, but can stand alone. Takes place the same day as “An Unexpected Shower,” and could be seen as a kind of prequel to that one-shot. “It’s not the heat . . .”: Filius and Pomona are on holiday. Filius has a longing. Can Pomona help? January 1962. Inspired by FFPS Flashfic Challenge #17 on the CR board — and by the current heatwave where I live. “The Cornish Pixie Prank”: A DADA teacher has pixie problems. A “Marauders’ Era” fic. Charming the Scottish Garden: A German Herbology master charms a Scottish garden. Will he also charm a Scottish witch? Draco’s Heart: Draco’s lips overcame his instant of surprise before his brain did, and responded to the unexpected kiss . .
“Malcolm’s Tale of Angus Óg”:Albus asks Minerva for a story, and she tells him one of her brother Malcolm’s tales, a story of his meeting with Angus Óg, and how Young Angus returned a favor of Malcolm’s with a special one of his own. August 1957. One-shot taken from A Holiday with the Headmaster. “Minerva’s Mistletoe”*: Minerva has fun the first Christmas after the war. A companion fic to “‘Twas the Night Before the Night Before Christmas,” chapter 27 of A Long Vernal Season and a Severus Snape one-shot posted to fanfiction.net and elsewhere, including here. When Madam Hooch’s heart goes out to a stray, what will it mean for her — and for Hogwarts? Begins in late September 1993 in Hogsmeade. STRAY weaves through The Prisoner of Azkaban, The Goblet of Fire, and, finally, The Order of the Phoenix. Characters: Rolanda X. Hooch, Severus Snape, Filius Flitwick, Sirius Black, Harry Potter, Ronald Weasley, Albus Dumbledore, Poppy Pomfrey, Minerva McGonagall, Rubeus Hagrid, and other canon characters. We always hear about Potter, Black, Lupin, and Pettigrew, but there was a fifth Gryffindor in their dormitory room. This is his story. Please do not take any of my stories as an infallible source for information about the real world, whether scientific, cultural, social, literary, veterinary, geographic or otherwise. I strive for verisimilitude, and borrow heavily from the real world, including historical figures, literary history, science, nature, and world culture, but verisimilitude is different from strict accuracy. (Some folk I have found to be either very literal or rather naive.) I hope you enjoy the stories! </a>It’s the Easter holiday week, and Albus returns from London early to surprise Minerva. A lemony ficlet. ADMM. April 1958. This entry was posted in A Long Vernal Season, An Act Of Love, Charming the Scottish Garden, Death's Dominion, Draco's Heart, MMADfan Story Images, RaMverse Series, Resolving a Misunderstanding and tagged ADMM fanfic, ADMM lemons, Alastor Moody fanfic, Angus Óg, AU HP fanfic, banners, Draco fanfic, Dream Angus, Dumbledore fanfic, Dumbledore/McGonagall fanfic, erotica, FFPS fanfic, Filius Flitwick Fic, Gertrude Gamp, Lemons, Minerva McGonagall fanfic, MMAD fanfic, Poppy Pomfrey fics, RaMverse Info, Rolanda Hooch, Sirius fanfic, Snape fanfic, Snape/Pomfrey fanfic, SS lemons, SSHG fanfic, SSPP fanfic, story info, story links. Bookmark the permalink.